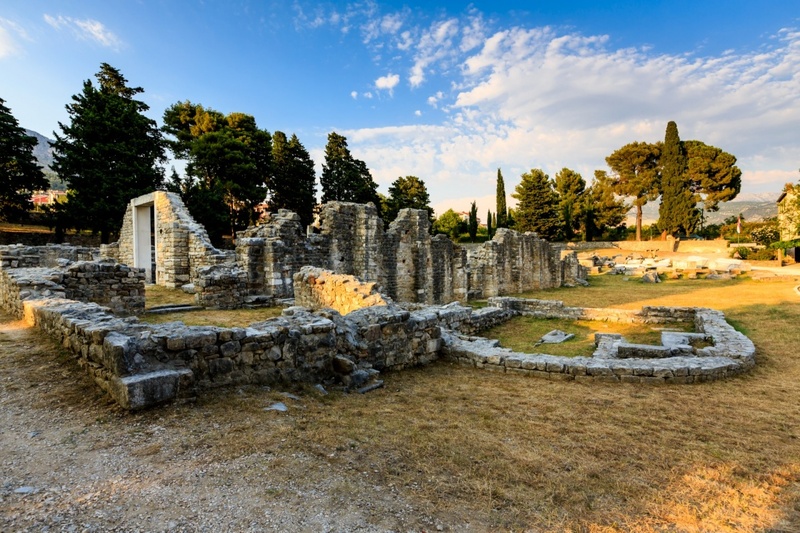 The history of early Split is tightly connected to the ancient Salona, the former capital of the Roman province Dalmatia situated 6 km north of Split in today’s Solin. Salona was the fourth biggest town of the Roman Empire, and is five centuries older than Split. It was the center of the Dalmatian civilization, culture and art; as the impressive monuments (thermae, forum, temples and the amphitheater) can today confirm. The historians agree that Split came into existence around the year of 305, when the Roman emperor Diocletian settled into his summer villa after retiring from the throne. Diocletian was originally from Salona and after his long and tiresome rule; he decided to settle near his hometown to peacefully spend his retirement years. So he built his summerhouse in the well-shielded bay on top of numerous medicinal and drinking water springs. The palace, spreading across the 30000 square meters, was designed in the manner of a military camp, protected by several towers and strong outer walls intended to battle off Barbarian invasions. It was a strong and intimidating fortress from the outside, but luxurious and comfortable summer palace from the inside. The Diocletian’s Palace is today among the biggest, the most important and best preserved ancient Roman monuments in the world. After Diocletian’s death in the year of 316, the Palace continued to serve as a refuge for his ancestors. 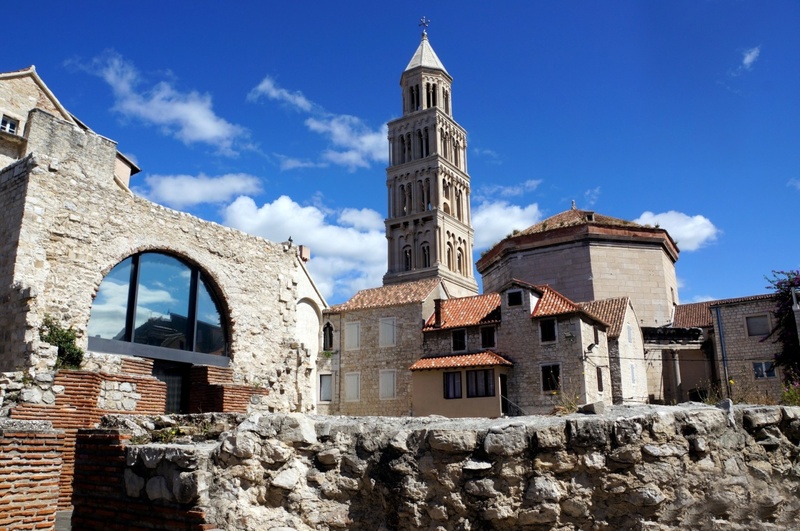 It the 7th century, as the Barbarian tribes devastated Salona, most of its inhabitants eloped towards Split and populated the interior of the Diocletian’s Palace seeking the protection of its firm walls. Through the next century various urbanistic interventions were made to adapt the Palace for living and gradually turning it into a medieval city. Through the late medieval period Split was under various occupants; from Hungarians to Barbarians; but the city managed to preserve its integrity and a level of independence. Split had the city statute, city council and the right to coin its own money. The rector was chosen among the members of the old Croatian nobility. In the period between 15th and 18th century, Split was under the Venetian dominion. It was the era of prosperity and intense cultural development. The local humanistic circle regularly gathered in the Papalic Palace; Marko Marulic being the most prominent member. Today known as the father of Croatian literature, he was the first writer to use the Croatian language. In this period Split had suffered several Turkish invasions and plague epidemics. The fall of the Venetian rule at the end of the 18th century brought the short lasting France dominion under Marshal Marmont. The most important token of the French rule in Split is the first modern style street, today popular Marmont Street. During the 19th century Split again falls under the Austrian government. it is the period when major Bajamonti significantly contributed to the city development. He built a theater, a monumental fountain and a palace on the shores, supplied the city with water, and introduced gas powered street lights. After the World War One Split finally fused with the rest of Croatia, sharing its destiny ever since. During the short periods in the Second World War Split came under Italian and German rule. Today Split is the administrative and cultural center of the region. Besides being a beloved tourist destination, Split is a successful city, proud of its historical values and natural beauties as well as its numerous internationally acclaimed sportsmen, businessmen and scientists.